Thank you again for everyone’s comments and questions on the video I posted this past Wednesday! 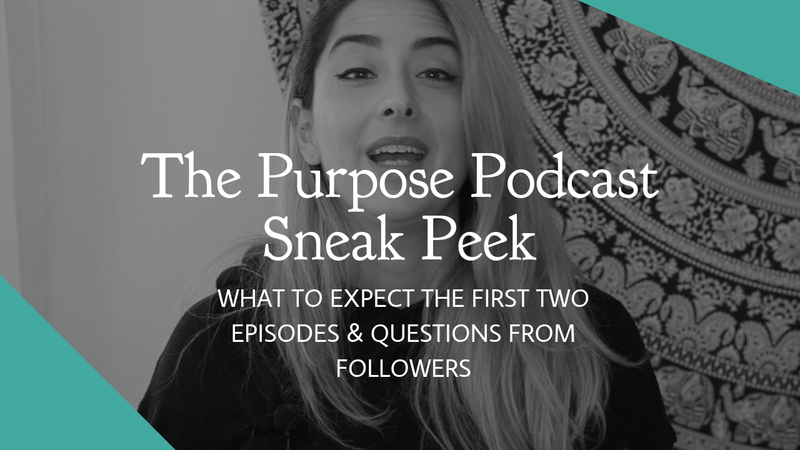 I can’t believe the Purpose Podcast is finally launching in only 3 more days! In today’s third and final video in the lead-up for the launch, I’m proving everyone with a sneak peek of what to expect in the first two episodes. I’m also answering some more comments and questions I received on the show, as well as providing the exact time to tune into the launch this coming Monday, January 7th. As I mentioned in the video, below you’ll find the names of our upcoming guests as well as their websites so you can check them all out and get to know them better prior to their episodes airing. Be sure to sign up for my email list to be alerted the moment the first episodes of the Purpose Podcast becomes available to download. I am so excited to get to share it with you and hope you will be inspired by these stories of resilience as much as I have been. Seriously, thank you guys so much for all the amazingly positive comments and questions you’ve been sending me regarding the Purpose Podcast launch. As you may know, my new interview show, the Purpose Podcast is launching this coming Monday on January 7th. On the show I interview guests who have faced incredible adversity and how they not only survived it, but thrived. As a survivor of miscarriage, abuse, divorce, and suicide-loss myself, I believe our conversations shared on the show regarding our experiences and what we learned as a result of them are guaranteed to inspire and motivate you to live your best life in 2019. Today I wanted to share a few quick teasers from our launch episodes which will be available on Monday. In episode one, I interview international magician Romany Romany, and her journey from battling anorexia as a child, being hit by a car and suffering catastrophic personal loss before finding her way on-stage and performing for the Royal Family. The path her life takes her to fulfill her childhood dream of being under the lights as a performer takes so many twists and turns it’s truly a miracle how magic was her answer all along. In episode two, I have the great honor of featuring my best childhood friend, someone I’ve had the privilege of knowing for over 30 years. Lauren Norinder shares her journey finding love overseas after the tragedy of 9/11, only to return to the United States years later and have her family’s new home completely devastated by the infamous Superstorm Sandy. She takes us along on her experience being literally homeless with two small children and facing bureaucracy and the media head on in attempting to rebuild their lives. Are you excited to hear these stories yet? Leave a comment below this video to let me know what you are most looking forward to on the Purpose Podcast! For now, I’m going to take some time to answer a few more questions and comments I received after my last video on Wednesday. Sandip reached out to me on Instagram and mentioned while he’s enjoyed these videos, he asked that I could maybe speak a little slower in them. That’s my “born and raised” New Yorker fast paced personality getting ahead of me! So I’m really trying to slow down a bit on this video and be more purposeful with my pacing so I’m easier to understand for everyone who uses English as their second language. Sandip thank you so much for the comment and I’m sure there are many others who agree with you and were hoping for the same! I received another question from Laura via email asking if there was a formal schedule of guests and the dates they are airing. This is a fantastic question. So we’ve recorded a total of 7 interviews that will be airing between January 7th and March 31st, which for simplicity’s sake I’ll refer to as “season one”. The episodes coming up feature Romany Romany, Lauren Norinder, Tiwanda Pierce, Cena Martin, Kelly Rozick, Laura DuBois and Shirin Peykar coming up in the next few weeks. I’ve included links to their websites in the corresponding blog post to this video so you can check them out in advance if you feel inclined to do so. The exact dates each of these air will be a surprise, so be sure to subscribe to the show to be notified of new episodes when they air. We’ll most likely begin recording episodes for season 2 which will air April through June sometime in February or March. If you or someone you know may be a good fit for the show, please visit www.corrielo.com/thepurposepodcast and feel free to submit a pitch to become a guest! I’d love to speak with you and hear your stories. I also received a few other questions on how to listen to the show, so I’ll go ahead and recap it again quick here. You can listen to the episodes either direct from my website, iTunes, Apple Podcasts, Spotify, Stitcher and also Facebook and YouTube! Facebook and YouTube are both new additions since my video on Wednesday and I’m so excited to be able to offer it there as well. To get updated on when new episodes air, which will happen every other Monday, be sure to join my email list at www.corrielo.com or subscribe on any of the platforms I mentioned previously that you frequent. Are you ready to be inspired and motivated to do more about your situation in 2019? Be one of the very first people to listen to the Purpose Podcast on January 7th at 8:00 AM EST! My goal is to get as many people to listen to the show as possible so that it can get featured as a New and Noteworthy Podcast on Apple Podcasts. In order for this to happen, we need you to download and listen to the welcome and first two episodes within 7 days of the show launching. It’s even better if you could also take a quick moment to leave the show a review. To learn how to do this, check out my video from this past Wednesday. Why is this important? It will allow the Purpose Podcast greater exposure and get these important stories of resilience to as many people as possible to hear them. It also will provide us better access to future guests with unique, incredible stories for new episodes. So this coming Monday, January 7th at 8 am, watch out for the announcement via email, my website, Facebook, Instagram or Twitter to get on and download the welcome and first two episodes of the Purpose Podcast. It would mean the absolute world to me. In the meantime, leave a comment below or on Facebook, Instagram or Twitter about the show. I’d love to hear what everyone is thinking! Thanks, and you’ll hear from me again on Monday. This entry was posted in The Purpose Podcast and tagged adversity, interviews, podcast, self-development, self-help, The Purpose Podcast.